The cooking sensation has been working in the kitchen since the age of 2. 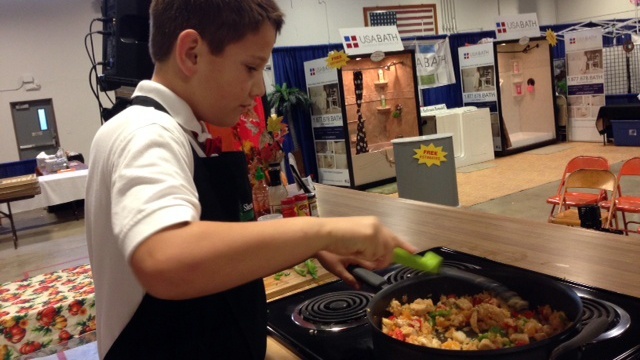 Partak is making a spicy chicken fried rice using mandarins and his secret sauce. He is on a mission to raise money for his school. Alta Vista Community Charter School is more than 100 years old and doesn’t have a stove or oven. Partak said kids should eat fresh and not have boxed lunches everyday. The goal is to raise $25,000 by the summer. Partak’s cooking demonstrations were set to take place at the Gold Country Fairgrounds at 11 a.m. Sunday. The Mandarin Festival kicked off at 10 a.m. and runs through 4 p.m.
Organizers said they had record crowds Saturday. More than 20,000 people came out in just one day. In the 20-year history of the festival, the biggest crowd has been 25,000 for the entire three-day event. Organizers credit the fact that farmers have produced the largest and sweetest crops they’ve seen in decades. For more information on how to donate to Partak’s school kitchen remodeling project, go to MasonPartak.com. ← Mandarin Festival Gift Basket Give Away! Good luck young Chef. The best for the holidays to you and your family. Thank you Chef Doug! We made $6800 at the Mandarin Festival!